Each year, a layer of new wood is added to the trees, between the old wood and the bark on the outside of the tree. As these new layers are added, the tree trunk and branches grow in diameter. Each layer of new wood forms a visible ring that you can see in a cross section of the trunk. Because this happens every year, you can estimate the age of a tree by counting its rings. Look closely at the rings. You'll notice that they are really two colors. The earlywood, the light-coloured band, is laid down in the spring and early summer, when water availability is the highest. Latewood is produced later on in the summer and in the early fall. Latewood cells are somewhat smaller than earlywood cells and have a much thicker cell wall, resulting in a darker color. 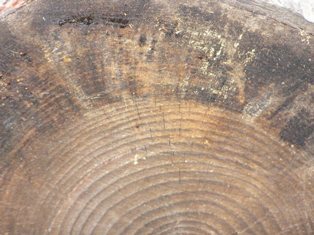 The annual rings of a tree provide scientists with a snapshot of the environment during the life of the tree. Generally, plenty of rain means wide rings and drought means narrow rings. 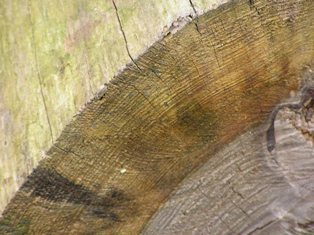 Scientists have also been able to identify lightening strikes, earthquakes, insect infestations, and climate change, based on the appearance of tree rings. 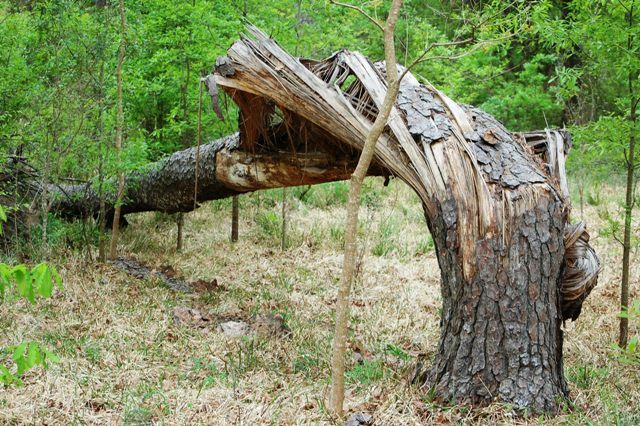 So, how old do you think this tree was before Hurricane Ike brought it down in 2008?